QuaQuaQua (NYC/Baltimore) and The Third Guy (Brussels) bring you pieces for an open-ended jack cable, strobe lights and midi pad, slaps in the face, virtuosic knife and hammer work, and light banter. Slovenian guitarist Primož Sukič and Spanish percussionist Ruben Orio make up The Third Guy, a duo based in Brussels, Belgium. They first met at the post master-academy program offered by the ICTUS ensemble and the HoGent Conservatory, with their official debut in January 2017, which was a result of an artistic residency at QO-2 in Brussels. 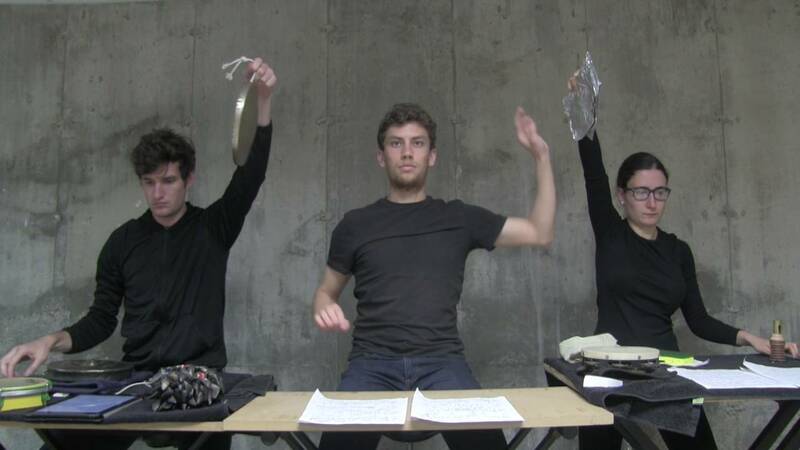 Their musical, and artistic research is based on composed works that explore, and blur boundaries between improvisation, programmed computer algorithms, and composition. The Third Guy also focuses on collaborating with other musicians (composers, interpreters, improvisers), and artists from other artistic fields, among whom each of them bring in new personalities and aesthetics, that, for every performance, reshape, and sometimes even redefine the identity of the ensemble. QuaQuaQua is a flexible (mostly percussion-based) group headed by local Baltimore percussionist Adam Rosenblatt (https://rosenblatt.live/). He and New York-based percussionist Terry Sweeney (http://www.sandboxpercussion.com/) will present composed pieces somewhere between performance art, contemporary music, and absurdist theater.